I bought similar stuffed pancakes for breakfast in Hong Kong and China hawker stall. They are simple to make great for breakfast or brunch. I think this is popular in Northern China rather than a Cantonese recipe. You can use any filling you like meat and veg, potato and vegetables (vegetarian) or even cheese and onion english style, great to use up any leftovers. 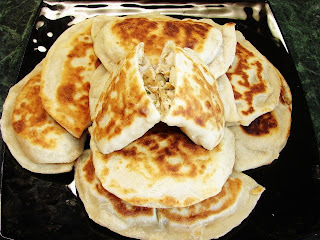 You can make them ahead and warm in the oven, great for fingerfood party or packed lunch. In a mixing bowl add the flour and mix in the oil. Pour boiling water in a cup add salt to dissolve. Pour all the water into the bowl. Mix the dough with chopsticks or spoon. It is quite lumpy at this stage. Cover and leave aside for about 30min. For the beaten egg, add a little oil heat till smoking hot and fry egg as omelette, brown on both sides then chopped into small pieces. Add some oil in pan/wok stir fry the garlic, add meat and cook till lightly brown, then add vegetables and chopped up omelette, stir fry for about 1 minute or till vegetables are tender but still crunchy. 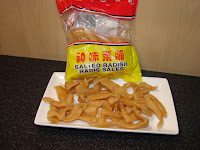 Seasoned with light soy (don't add too much the pickled radish can be salty), pinch of pepper and dash of sesame oil. Heat off, add spring onion and coriander. Leave to cool. Dust with flour and roll each piece of dough into a thin pancake about 15cm diameter. Keep turning or rotate the dough when rolling making it easier to roll it out to a perfect round shape. Fill half of the rolled out dough with few tbsp of filling, dampen half the edge with some water. Fold the unfilled side over to form a crescent shape. Press gently to seal then trim off any uneven edge with a small knife. The pancake is ready of frying. To fry the pancake, brush the frying pan with oil then fry till golden brown on both sides. ** If you like the pancake to be more crispy add more oil when frying. ***Suitable for vegetarian: use any vegetables mix you like, IMO the pickled radish is essential as it gives a salty and savoury taste. I saw Gary Rhodes making these on his Rhodes Around China programme. On another note, my mum gave me some dried scallops a friend brought over from HK. I'm very excited!